We do not eat enough fish. Whilst as school I used to work in the seafood department at a supermarket, and after seeing how many days thawed fish fillets were put out on display, tarted up with plastic parsley and at night we would put is all back in the chiller ready for the next day. So because of this, I cannot buy fish from supermarkets, and only like the freshest fish (preferably caught by myself on mums boat Zinkwazi). Fish is also a lot more expensive than other meats (unless you catch it yourself). Here in Perth we have one of the finest fishmongers Kailis Bros just down the road and on Sunday I picked up some <em>red throat emperor</em> fillets for this recipe. Sumac [wiki] is not an ingredient I have used before, but I picked some up a few weeks ago to try, and this recipe was a first attempt. Sumac is very lemony in flavour and works well with fish, and is available form Middle Eastern shops or delicatessens. Combine the lemon juice, red wine vinegar, and 2 tablespoons of olive oil in a a large bowl, season to taste with salt and black pepper. Blanch the beans in asaltd boiling water for 2 minutes or until tender. Drain and refresh under running cold water, then either spin in a salad spinner or pat dry with a paper towel. Place in the bowl with the dressing, lentils, celery and parsley and toss. Heat the remaining oil in a large non-stick frypan over medium heat. Add the fish anf cook for 2-3 minutes, then turn and cook for a further 2-3 minutes until just cooked trough. 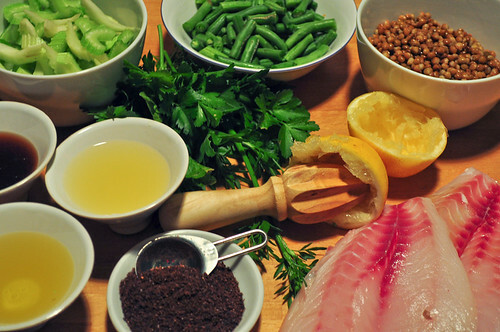 Be careful not to overcook, I hate overcooked seafood, which is why it must be as fresh as possible. 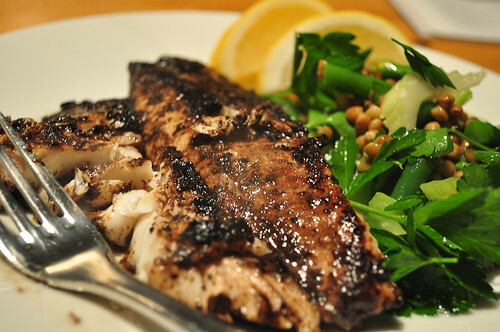 Divide the salad amongst serving plates and top with fish fillets, and serve with lemon wedges.